Landscape Installation is a very important part of creating an alluring property appearance. Landscape installation can substantially increase the value of your property allowing you to easily gain a 100-percent return on your landscaping investment. Even if you do not intend to sell your property in the near future, landscaping is a great way to experience personal satisfaction from your property. Not only does a well landscaped property improve the appearance, it also improves the environment. 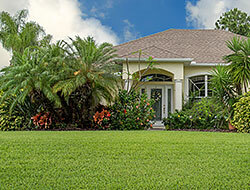 Lush green lawns will enhance your mood and encourage you to spend more time outdoors enjoying your new landscape. Landscape Installation requires specialized equipment and extensive knowledge and experience. That is why it should be handled only by experienced professionals like California Creations. We have over twenty years of experience and own a fleet of trucks (ranging from 5,000 to 50,000 GVWR) and a half an acre full of landscape construction equipment. We use our vast experience to create landscapes that are beautiful and easy to maintain. Since California Creations is a full-service landscaping company, we understand how all the different aspects of a landscape must be integrated in order to attain the desired results. Due to our extensive knowledge of plant materials, we are highly qualified to decide which combination of annuals, perennials, ground covers, trees, etc. should be incorporated into each design to satisfy our clients’ specific needs. Hardscaping is also a very important component of Landscape Installation and we are highly proficient in that domain as well. California Creations focuses on creating spaces that are functional and attractive. Every feature that we incorporate into our landscapes add to the beauty of each property. We use the ideal mix of colors and textures of plants and materials (i.e., concrete, pavers, stone, brick, tile, wood, etc.) to create visually captivating yet practical landscapes. Every design is customized to meet our clients’ specific requirements. Landscape Installation is a specialized field and California Creations works on every project, large and small, with equal amounts of expertise and insight. Our designers work very closely with you and understand your tastes and requirements to provide you with designs and solutions that will work for you. Regardless of the type of landscape you desire (i.e., low-maintenance, drought-tolerant, xeriscape, child-tolerant, pet-friendly, athletic fields, California native, tropical, formal, Southwest, Mediterranean, etc. ), California Creations has you covered. California Creations is extremely passionate about landscape design & installation and all our projects are exemplary in every possible way. We use high-quality equipment and materials. 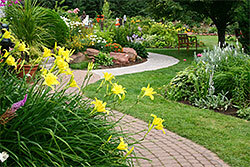 Upon your request, we will create unique and alluring landscaping and hardscaping features throughout your property. 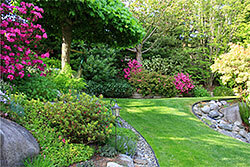 If you have a landscaping idea, we at California Creations will turn it into reality. If you would like us to provide you with ideas, we would be happy to do so. Feel free to call us at (818) 833-1231 or submit our online form for the best landscape design and Installation.